ERRATA: On page 3 and page 4 of the rules, it should read "A Scoring round automatically occurs during a Treasure chest action where there are at least 4 treasures in at least one dungeon." The young and successful merchant sailor, Edmond DantÃ¨s is sailing back to Marseille to marry his fiancÃ©e. Upon his return, DantÃ¨s finds himself falsely accused of a crime he did not commit. Soon after, he is imprisoned, without trial, in the Chateau dâ€™If. 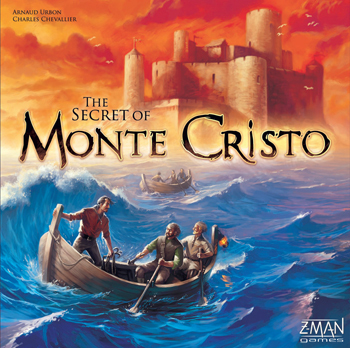 It is during his sentence that he learns about the existence of a colossal treasure buried on Monte Cristo. After successfully escaping from his jail, he finally manages to reach the island of Monte Cristo where he does, in fact, fi nd the treasure. With this newly acquired wealth, DantÃ¨s sets his revenge in motion. After finally finding peace many years later, DantÃ¨s leaves for a mysterious and unknown location to find solace and love. It is rumored that the Count of Monte Cristo has hidden a large part of his wealth in the dungeons of ChÃ¢teau dâ€™If. Numerous adventurers, aboard untrustworthy skiffs, set forth towards the castle, hoping to get their hands on as much treasure as possible. Players control a number of adventurers who set foot in ChÃ¢teau dâ€™If. Their objective is to explore the different dungeons and gather the most valuable treasures. They must ensure that they will have a sufficient number of adventurers on the island as well as enough bags to carry this treasure away from the island. You will strategically place your adventurers in the various dungeons, according to the treasures that can already be found there. When a new treasure is revealed, you will place them to make sure that your crew reaches it first. With the help of the Action slide, you will plan your actions to play them at the right time and gain the upper hand! Once a player reaches 40 points on the scoring track during the Treasure chest phase, the game ends. All the treasures are added and the player with the most points wins the game. The game comes with a unique component: the action slide using marbles to determine order of player actions.